After a grueling three days of poker in Event #14 of the 2013 World Series of Poker, it was Jonathan Taylor who walked away as the champion. 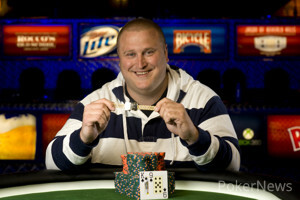 Taylor bested a field of 1,819 players to lock up a bracelet and $454,424. Taylor started Day 3 second in chips, coming into the final 14 players just behind Hiren Patel. Taylor battled through the day and watched the eliminations of Benjamin Dobson, Chris Hunichen, Morgan Machina, Daniel Paska, and Russell Crane before making it to the official final table. Once Taylor reached the final table he coasted under the radar. 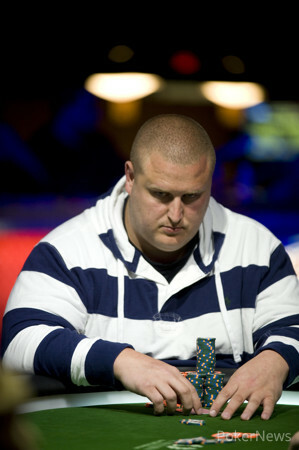 Joseph Pergola exited first when he found himself short stacked after doubling up Patrick Kubat. Eventually, he was all in against Patel and was eliminated in ninth place. Next to go was Dan Gannon, who had multiple tangles with Taylor. On his last hand, Gannon moved his short stack all in after seeing a flop against Taylor. Taylor had king-high and it was good enough to send Gannon to the rail in eighth place. Leaving in seventh place was Jed Hoffman. Hoffman and Bohn decided to play a huge flip and Hoffman ended up on the losing end, sending him to the rail in. Going home in sixth was Patrick Kubat. Kubat doubled up Hunter Frey then ended up moving the last of his chips all in for a flip against Patel. Going in fifth was Tommy Vu. Vu found himself in a cooler spot with top two pair against Taylor's set eliminating him from the tournament. Patel exited the tournament in fourth place. Taylor made a move all in from the big blind over Patel's open and was called quickly. Taylor was able to win the race though and scooped up another huge pot vaulting him into the chip lead. Frey came into the final three third in chips and he ended up leaving in third place. Frey shoved all in over Taylor's opening raise and was snap called by Taylor's . Taylor held up and it was off to heads up play. Taylor started heads up play with a two-to-one advantage, and he never let off the gas pedal. He took pot after pot from Bohn, before Bohn was finally forced to call an all in shove with . Taylor was holding the and was able to spike a on the turn to secure the victory. That's all for us here in Event #14: $1,500 No-Limit Hold'em. Be sure to stay here with us at PokerNews.com for exclusive coverage of the rest of the World Series of Poker 2013. Hand #140: Blake Bohn had the button, and folded. Hand #141: Jonathan Taylor limped in on the button, Bohn checked, and the flop came . Bohn led out for a bet, and won the blinds and antes. Hand #142: Bohn raised to 200,000 on the button, Taylor three-bet all in for effectively 1.5 million or so, and Bohn called. The rail shouted for an assortment of cards as the dealer fanned . Taylor was still behind, but he picked up a gut-shot straight draw. The on the turn gave him the lead, and sent his rail into a frenzy. It was all over when the completed the board, and Taylor shook Bohn's hand before celebrating with his friend. Congratulations to Bohn for the deep run. He will earn $281,049 for his second-place finish. Hand #132: On the button Bohn raised to 170,000. Taylor moved all in from the big blind. Bohn folded and Taylor scooped the pot. Hand #133: Taylor raised on the button and Bohn folded. Hand #134: Bohn moved all in from the button and Taylor folded. 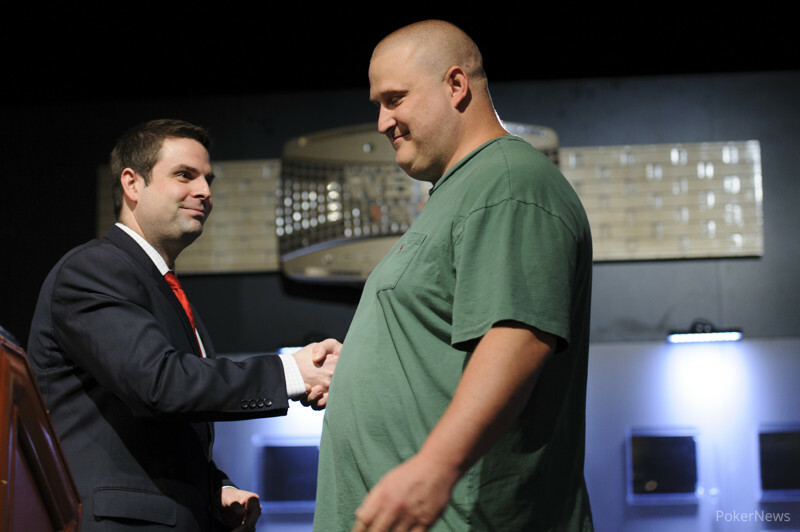 Hand #135: Taylor raised to 160,000 from the button and was called by Bohn in the big blind. 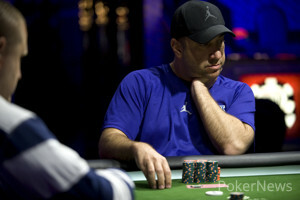 On the flop, Bohn checked to Taylor who bet 130,000. Bohn moved all in and Taylor folded. Hand #136: On the button Blake Bohn raised to 200,000, forcing a fold out of Jonathan Taylor. Hand #137: Taylor raised from the button and took down the pot. Hand #138: Bohn raised to 200,000 from the button and Taylor folded from the big blind. Hand #139: Taylor raised to 160,000 from the button and was able to scoop the blinds and antes. The buzz inside the walls of the Rio extends beyond just the tournaments on the 2013 World Series of Poker schedule. Online poker in Nevada is a very, very hot topic right now, and WSOP.com is making a lot of noise. While the site has yet to launch, you can head to the Lambada Room of the Rio or look for one of the beautiful and friendly WSOP.com ladies walking the hallways to sign up for a free, personal WSOP.com online poker account. This is a great way to get a jump on the site's registration, and plenty of people have already taken this opportunity. What's more is that the WSOP will be hosting daily raffles for everyone that has taken the time to register for WSOP.com at the Rio. What can you win? Plenty of fantastic prizes including 36 WSOP seats! Players 21 years of age and older who sign up for a WSOP.com account will automatically be entered into the “36-Seat Giveaway” where a randomly-selected winner will win a seat into the next day’s first WSOP gold bracelet event. One of the events eligible in this promotion is the $111,111 One Drop High Roller No-Limit Hold’em tournament that is expected to feature a $10,000,000 prize pool and allow you to play poker with the biggest names in the game. In total, $182,333 in WSOP seats, including a seat to the WSOP Main Event, are being given away during this one-of-a-kind WSOP.com promotion. 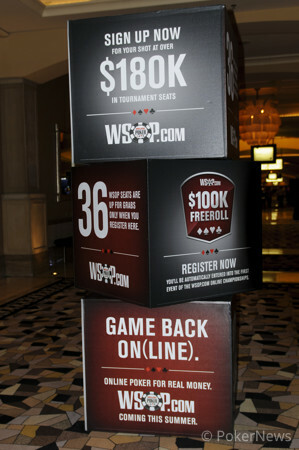 In addition to the 36-Seat Giveaway, a “Hot Seat” promotion will allow any player who signs up for a WSOP.com online account and wears their WSOP.com patch on their chest at the table while playing an event to be randomly selected to receive 500 bonus dollars deposited directly into their WSOP.com online account once the site has received all regulatory approvals and launches. With 62 WSOP gold bracelet events and three winners promised for the Main Event, this promotion includes $32,000 worth of value to those participating. Hand #131: On the button Jonathan Taylor raised to 120,000. He was called by Blake Bohn in the big blind. On the , Bohn checked to Taylor who bet 100,000. Bohn moved all in only to see Taylor fold. Hand #128: Blake Bohn raised to 140,000 on the button, Jonathan Taylor called, and the dealer fanned . Both players checked The turn was the , both players checked, and the completed the board. They checked again. Taylor showed for a pair of eights, and won. Hand #129: Taylor raised to 120,000 on the button, Bohn quickly called, and the flop was . Bohn checked, Taylor continued for 100,000, and Bohn instantly check-raised to 200,000. Taylor called. The turn was the , Bohn led out for 260,000, and Taylor called. The completed the board, Bohn quickly checked, and Taylor unhappily knuckled behind. Taylor showed for a straight, and Bohn flashed for a flopped two pair. Hand #130: Bohn raised to 140,000 on the button, Taylor called, and the dealer fanned . The two checked. 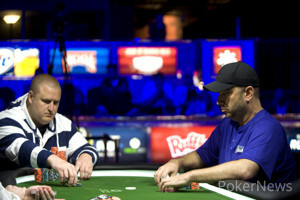 The turn was the suicide king ( ), Bohn checked, Taylor bet 140,000, and Both check-raised to 505,000. Taylor went deep into the tank, then re-raising, moving all in. Bohn snap-mucked. Hand #121: From the button Jonathan Taylor raised to 120,00. In the big blind Blake Bohn made a reraise that instantly send Taylor's cards flying to the muck. Hand #122: Taylor got a walk in the big blind. Hand #123: Taylor raised 120,000 from the button. Bohn called from the big blind. On the flop, Bohn checked to Taylor who bet 100,000, forcing a fold from Bohn. Hand #124: Bohn raised to 140,000 from the button. Taylor called. On the flop, Taylor checked to Bohn who bet causing a fold from Taylor. Hand #125: On the button Taylor raised to 120,000. Bohn called in the big blind. On the flop, Bohn checked to Taylor. Taylor bet out 100,000 and Bohn folded. Hand #126: Bohn raised to 140,000 from the button. From the big blind Taylor made the call. The flop came and Taylor checked. Bohn bet 200,000. Taylor tanked for a bit, but eventually folded. Hand #127: Taylor raised to 120,000 from the button and was quickly called by Bohn. Both players checked to the flop. On the turn, Bohn bet out 175,000. Taylor called. On the river, Bohn checked and Taylor checked. Bohn scooped the pot with the in his hand.